VMware Research | VMware Researcher Mihai Budiu wins EuroSys '17 Test of Time Award for Dryad! VMware Researcher Mihai Budiu wins EuroSys '17 Test of Time Award for Dryad! 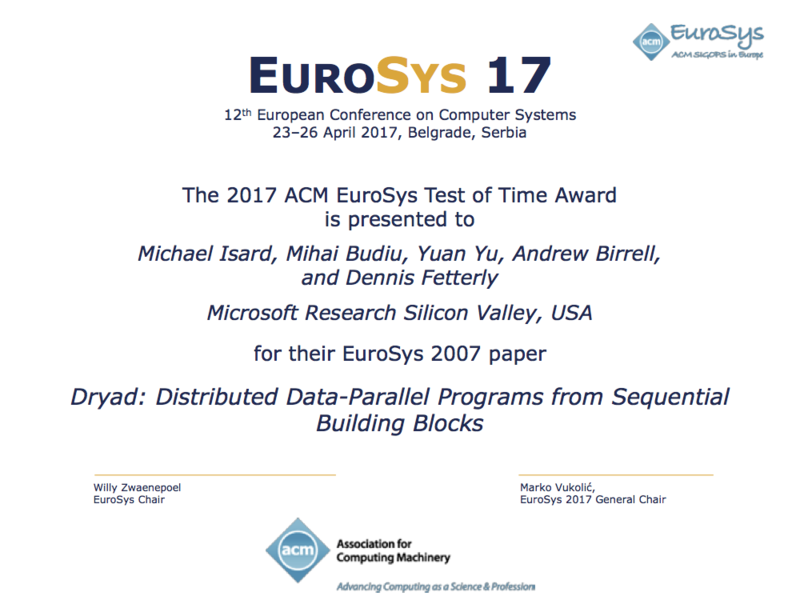 VMware Researcher Mihai Budiu won the EuroSys 2017 Test of Time Award for Dryad: Distributed Data-Parallel Programs from Sequential Building Blocks. Mihai shares the award with notable authors from the artist formally known as Microsoft Research Silicon Valley; Michael Isard, Yuan Yu, Andrew Birrell and Dennis Fetterly.